Get safety of food ! Surfcera is environmentally friendly natural anti-bacterial wash. No chemicals, chemical treatment or additives are used in this product. Surfcera is made primarily from the extremely small alkali molecules found in sea shells. As a result, Surfcera can penetrate vegetable skins to eliminate agricultural chemicals attached to the surface. Surfcera also eliminates the fungus and bacteria which cause foods to spoil, inhibiting oxidation to keep them fresh. 1.Dissolve Surfcera in water and soak food in the Surfcera solution for 5 to 10 minutes. Suitable containers: stainless steel, glassware, ceramic, porcelain, polypropylene, polyethylene based products. 2. The solution dissolves contaminants, and the resulting cloudy appearance is an indication of the contaminants removed. 3. After draining, keep the food in a plastic bag and refrigerated. The Surfcera solution can be used multiple times, so washing in bulk is possible. Keep food fresh and eliminate waste by keeping food in plastic bags and refrigerated after using Surfcera. It is recommended that food is placed in plastic bags without washing off the white powder (calcium particles) after draining, as this will diminish the preservative effect. It is recommended to wash off just before cooking. 2. Removing contaminants that weaken the immune system. 3. Revitalizing the original taste and flavor of food. Surfcera can be disposed into drains after use, cleaning drainpipes and rivers, as it returns to the environment. Surfcera eliminates agricultural chemicals and environmental endocrine disrupters like fthalide, and Escherichia coli O157 in the comfort of your own home. Once food that appears to be clean is soaked in the Surfcera, the contamination dissolves and causes the solution to become cloudy. To eliminate surface pollutants, increase sweetness and get better texture. For firm meat and richer taste. To eliminate the germs on eggshell surfaces and improve the elasticity of boiled eggs. 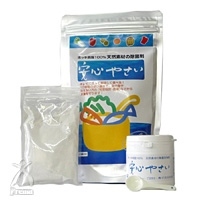 To eliminate germs on fish scales and gills. For firm meat and improve elasticity. the more powerful Surfcera''s cleansing effect is.